Moving right through Stephen R. Lawhead’s Bright Empires series and here’s what I thought of Book 3: The Spirit Well. I’ve always loved Stephen R. Lawhead’s books, and the Bright Empires series is another fantastic addition, if a bit of a departure from his usual strictly Celtic historical fare. Actually these books have more in common with the Song of Albion trilogy rather than with his Pendragon Cycle or King Raven series. I’ve been really loving the convoluted adventures of Kit Livingstone and Wilhelmina Klug and trying to wrap my brain around it all. If you’ve read the first two books (and you should!) and you’re confused, that’s okay, because a lot of questions are answered in The Spirit Well. Of course, plenty of new questions arise, too. But I find Lawhead satisfies my burning curiosity just enough to keep me going. He is starting to wax more philosophical now, too, explaining some of the grander themes behind the epic quest for the Skin Map and the unknown treasure it points to. 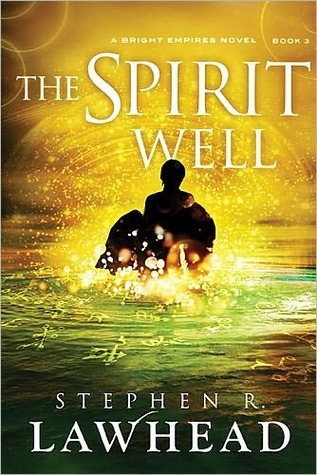 The Spirit Well is everything I want a supernatural adventure to be: plenty of mysteries, wonders, twists, and interesting characters with whom to share the journey. Another great read! I’m looking forward to picking up book 4: The Shadow Lamp. Thanks so much for the intel! I have never read a Lawhead book but have been hearing about him recently. I’m going to have to go find the book and give it a try! Found you through UBC. I don’t read much fiction at all but I know that I should incorporate them to my reading. Thank you for the review. Read what you want to 🙂 I’m not much of a non fiction fan, myself, and I don’t read it unless I really need to. But if you can find fiction that appeals to you, all the better.